Okay so this post is coming pretty late but better late than never! 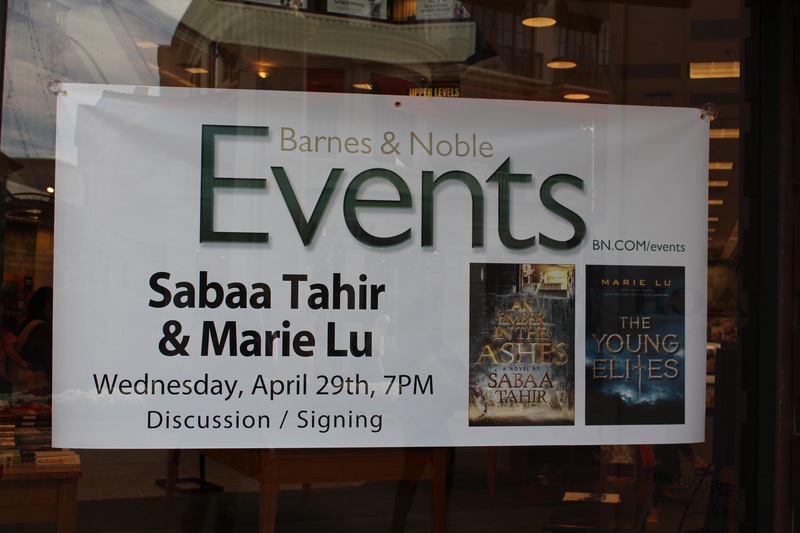 I was able to meet Sabaa Tahir and Marie Lu at a stop on the An Ember in the Ashes tour a few weeks ago. The event actually came up pretty last minute for me as I noticed it was going to happen about two days beforehand. I quickly asked my friends if they wanted to go and two of them did (one who is not a reader at all but loved The Young Elites). Wednesday afternoon quickly came and we headed up about at three. 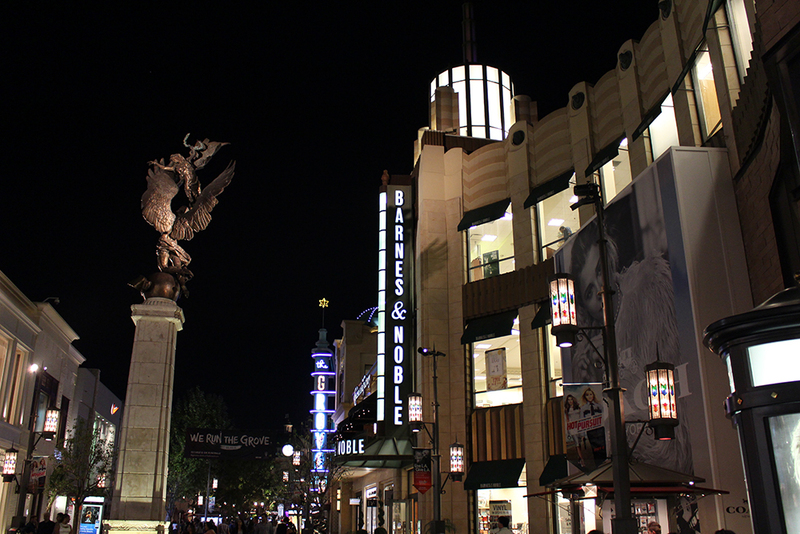 We did have to sit through some traffic, but we did still arrive at The Grove early enough for dinner. Luckily, there was a Cheesecake Factory next door to this Barnes & Noble. After dinner, we made our way over. The Barnes & Noble was huge! Three stories! I was in book heaven! The event took place at the top level where there is an area set aside for author events. There was a nice stage seat up with a desk, wooden paneling, and comfy chairs. A lot of events definitely go on at this location. Finally, the event started. Sabaa Tahir and Marie Lu came out and began talking. It was really interesting to learn their writing schedules and quirks. Marie Lu likes to listen to music while she writes but only scores. Sabaa Tahir said she has to find ways to write around her kids’ schedules and often times goes to coffee shops. Sabaa also told us how parts of her childhood and how her time working at The Washington Post inspired An Ember in the Ashes. The signing came, and Marie Lu went through the line and was able to add the personalization to my copy of The Young Elites since she was only able to sign it at Yallwest due to the long line. When I finally got to Sabaa Tahir, she signed my book and a sampler that is in one of my giveaways. Let me tell you, she has the coolest signature. Look at it! There were a bunch of other LA authors in the back rows who were there supporting their friend Sabaa, which I thought was so awesome. 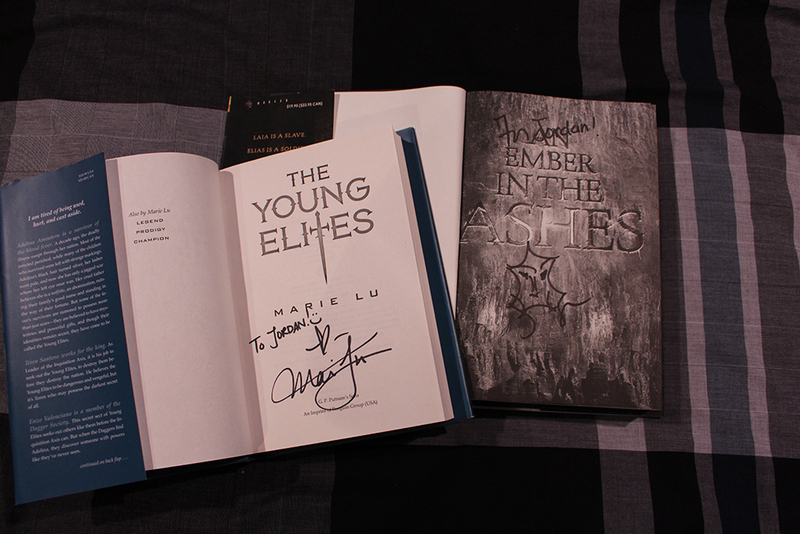 My friend who loved The Young Elites talked with Marie Lu for a little bit. I was so proud of her for going out of her comfort zone. Overall, the event was great! I would definitely see these authors again and attend another event at this Barnes & Noble.